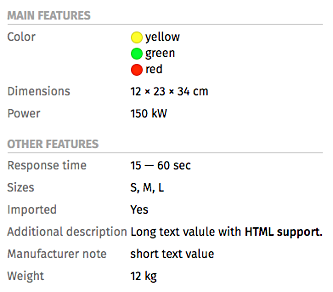 In addition to products' basic properties such as name, URL, images, recommended products, etc., you can show products’ extra features; e.g., color, size, weight, purpose, screen size, power, etc. 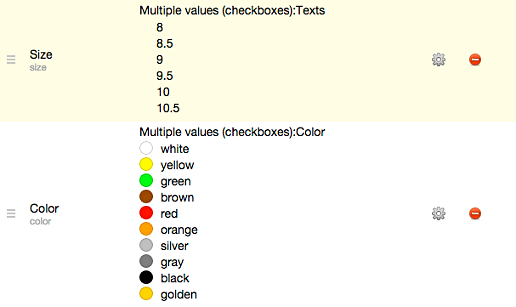 Custom product features can contain data of various types: simple text string, long multi-line text, number, color value, numerical value with a measure unit (length, power, weight, area, time), or simple logical "yes/no" value. These extra details provide additional useful information to shoppers about your products. Read more about what different types of product features can be used for. 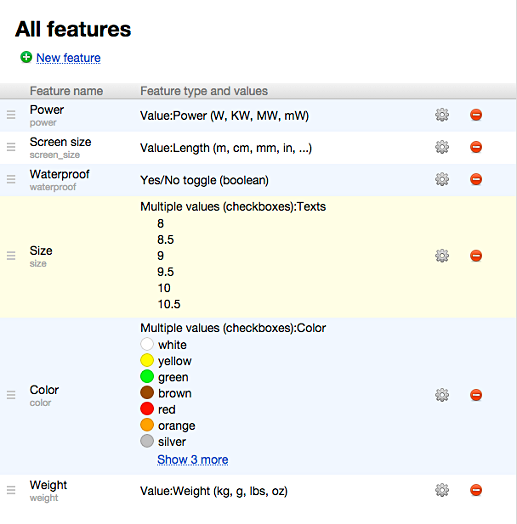 Extra product features are set up in “Settings → Product types & Features” section. Individual products’ features must be completed in “Products” section. The feature with ID weight is a special one, because it is used to store products' weight which is taken into account by various shipping cost calculation plugins. 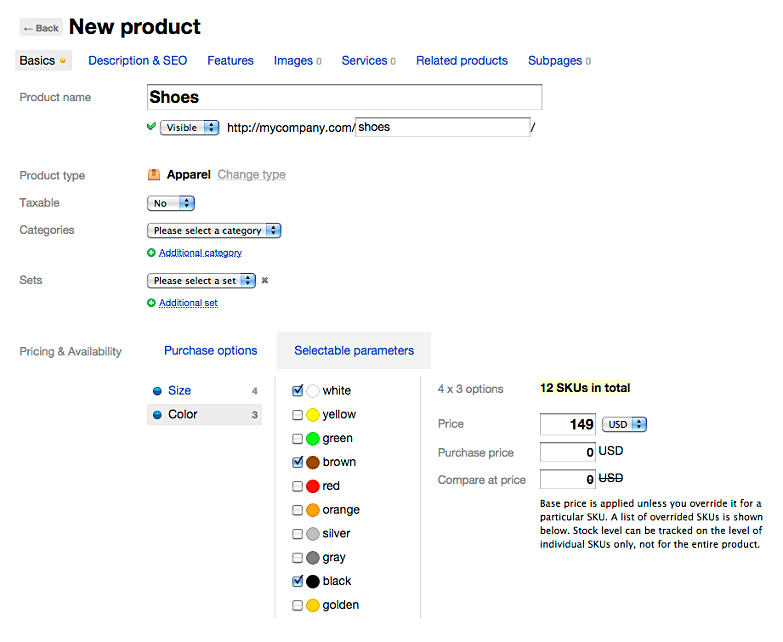 Do not delete this feature to ensure correct function of your online store. In addition to simply providing additional information about a product, custom features can also facilitate the selection of the desired SKU by a shopper in the storefront. 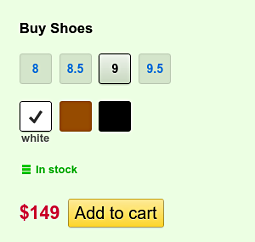 Suppose that a client wants to order a pair of shoes of size 9 and white color. With the automated SKU selection option, a client can simply click on the desired feature values, and the corresponding SKU will be automatically added to the shopping cart. Now let us add a new product and enable mode "Selectable parameters" under the Basics tab. 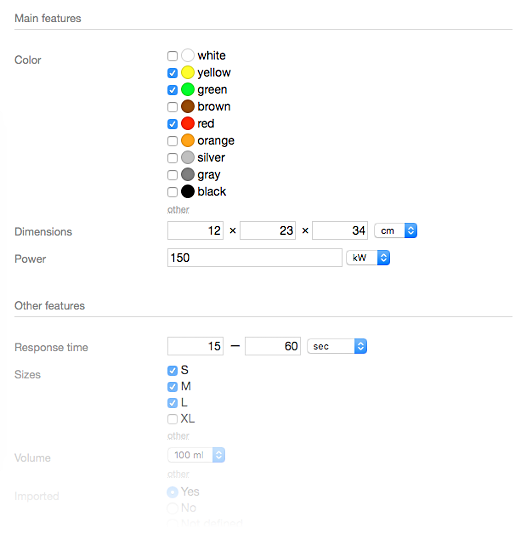 In this mode, enable all values of the "Size" and "Color" features, whose combinations you have available for ordering. After saving the product, Shop-Script will automatically generate SKUs corresponding to all combinations of the selected feature values. Now open the public URL of your new product in the storefront to see that a customer is offered a choice of various feature values rather than a list of individual SKUs. 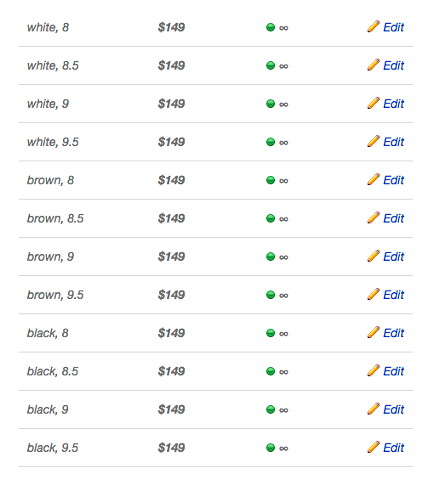 By selecting these values, a customer actually selects the corresponding SKU which is then added to the shopping cart.